After Andy and I got married and began combining our incomes, we knew both of us would have to live off his income because I didn’t (and still don’t) have a job at Fort Knox. We’re fortunate that the military pays for things like housing, healthcare, and a portion of our groceries (technically BAS is for the servicemember only, but we’ve found it’s more than enough for the 2 of us), which helps us with our budgeting, but still…. 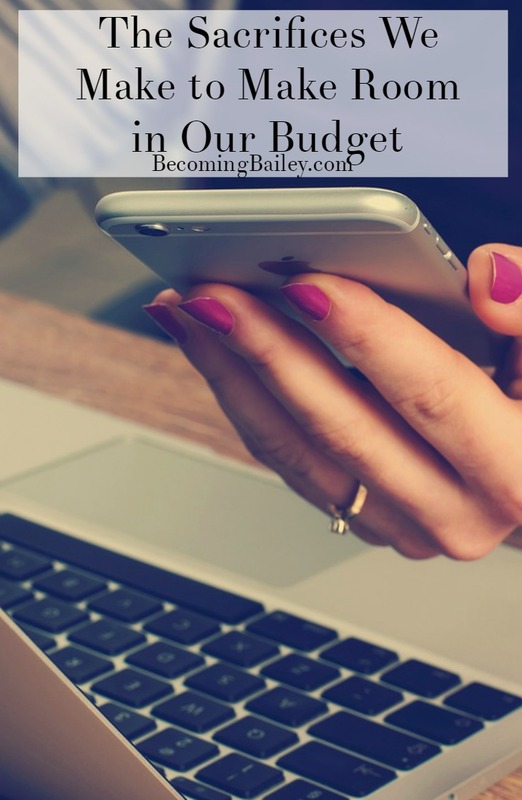 I won’t lie, I was terrified when I made our first married-life budget. We knew we would have to cut corners somewhere, and below are the areas that we decided to cut out of our lives. Shockingly, I don’t miss them that much anymore. I loved my Planet Fitness back in Owensboro, but when I moved to Fort Knox, I knew I would have to end the membership because the nearest Planet Fitness was 30-45 minutes away. Thankfully, we get free memberships to the on-post gyms. We did, however, splurge on a used treadmill because I prefer to watch on the treadmill while watching television. I paid off my car last year, and Andy paid cash for his truck before he even met me. We both plan to drive these babies until they die. We hope to have enough money saved for a used, new-to-us vehicle when either car kicks the bucket. This one was a hard one for Andy, because if he was feeling hungry, he’d just stop at the gas station for some grossly overpriced soda and snacks. After showing him how much money he could save by buying snacks from the grocery store and packing them with him, he was totally convinced that preparing ahead of time would help us save money. I used to go to the mall when I was bored and buy some more work clothes. I realized when we were moving that I have way too many clothes, and wear only a small fraction of them. I’m not buying any new clothes until my old ones fall apart! Also, I’m not currently working, so I don’t need as many nice clothes. This one was a hard one for me, because we all know I’m a huge bookworm and love to read. I also used to work at LifeWay, so it wasn’t unusual for me to spend hundreds of dollars a year on books. It was sickening, really. Andy and I have decided to forego buying new books, and for me to read the books I already own or borrow from the library. If I absolutely need to buy a book (only when I need a book on a specific topic for an issue I’m going through), I’ll look for a used or ebook copy instead of paying full-price for a hardcover. Before we got married, we were huge restaurant frequenters. It wasn’t easy for Andy to cook in the barracks, so he’d often order takeout multiple nights a week. When we began dating, we went out to eat all the time because it was so hard to cook at my mom’s house. Now that we have a house of our own, we are cutting out the excess restaurant meals and cooking at home. What are some sacrifices you make to make room in your budget?